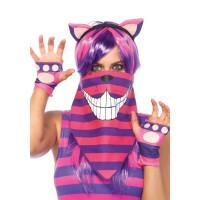 This fun cosplay Cheshire Cat costume is in cozy fleece - great fun for a scifi or anime convention! Cozy fleece purple and pink striped dress has a zipper front letting it serve double duty as a jacket as well as a dress. The attached hood has cat ears and the long tail is slightly padded. Great over jeans or leggings too! Item Number: LA-c85553 | Approximate Size (Inches): 10.00 wide x 3.00 deep x 14.00 high | Approximate Shipping Weight: 2.00 lbs.